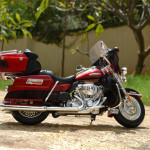 I am a diehard motorbike freak, riding is my passion and even after few horrible accidents I and still dancing on 2wheels. But when it comes to diescasts cars have overtaken the bikes even though the bikes started the game. I like Japanese bikes in very sporty colors and Italian riders on them so you know who my racing icon is? Yes it is Rossi. Here is an Italian bike with lots and lots of character thrown at it. It is RSV1000R made by Aprilia an Italian motorcycle company, one of the seven marques owned by Piaggio. 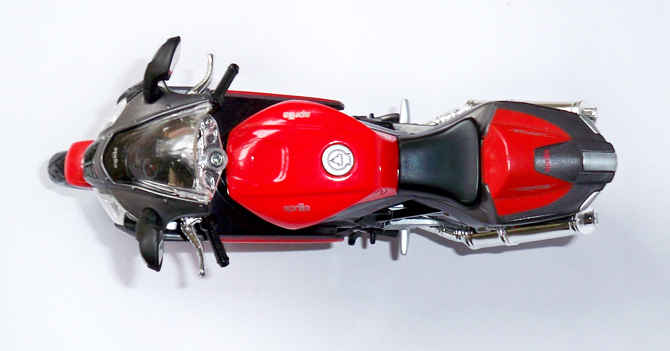 It is a Superbike with a 998cc V-twin, 4-stroke, liquid cooled engine and the bike can reach a top speed of 270 kmph. 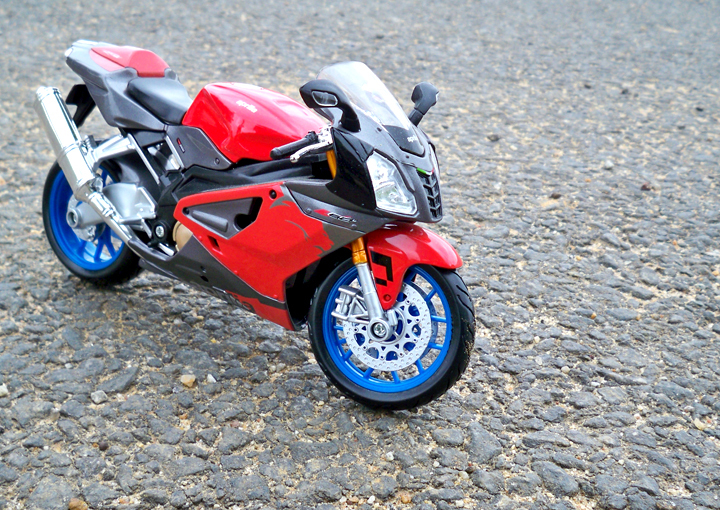 So what I got is a “RSV1000R Factory” which comes in a snazzy red & gray body finish and a set of blue alloys. 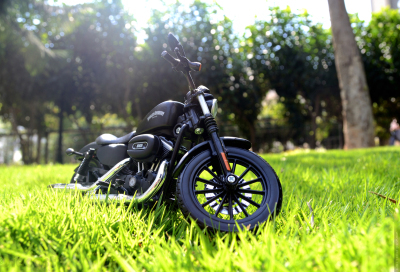 Made by Maisto to a precise 1:12 scale, the real bike’s character has been captured very well. 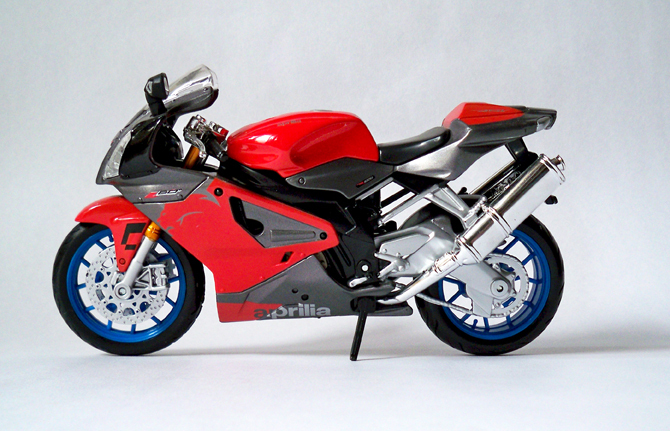 The decals are detailed especially the red lion on the body and the “aprilia” badge below that. 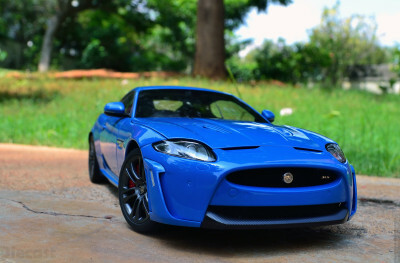 The paint finish is exceptional which glitz under the natural/artificial lighting. This is a camera friendly model (bright colors gives execptional results) so encourages me to take him out for outdoor shooting, which I offen do. Being a sports bike the engine is not exposed but the air scoops and aluminum alloy swing arm looks stunning. 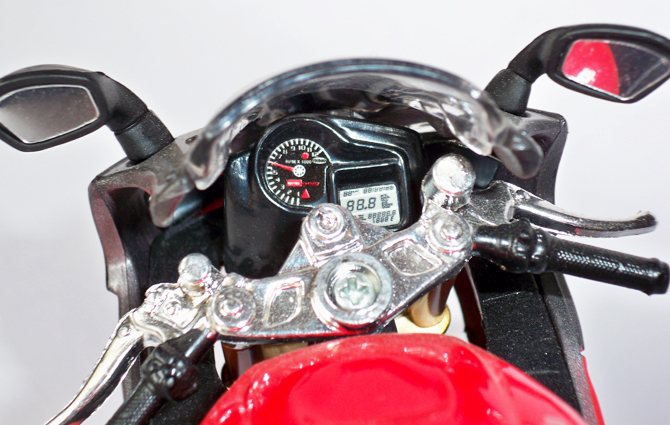 Clock and dials look ok in details, nothing so ground breaking. This is indeed a very nice model for your collection and worth spending those 400 odd bucks on. 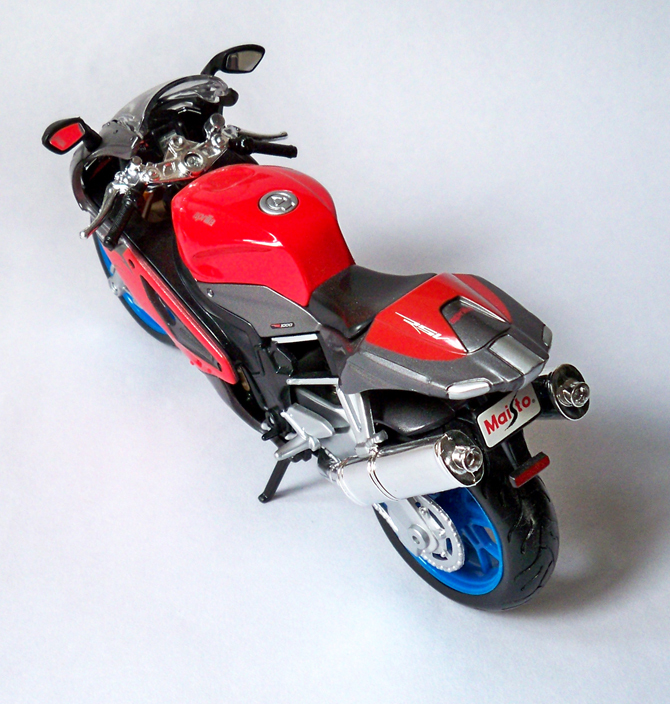 One aspect which I would like to mention is weight which Maisto keep on reducing in their model lineup which is very evident in the bikes than cars. 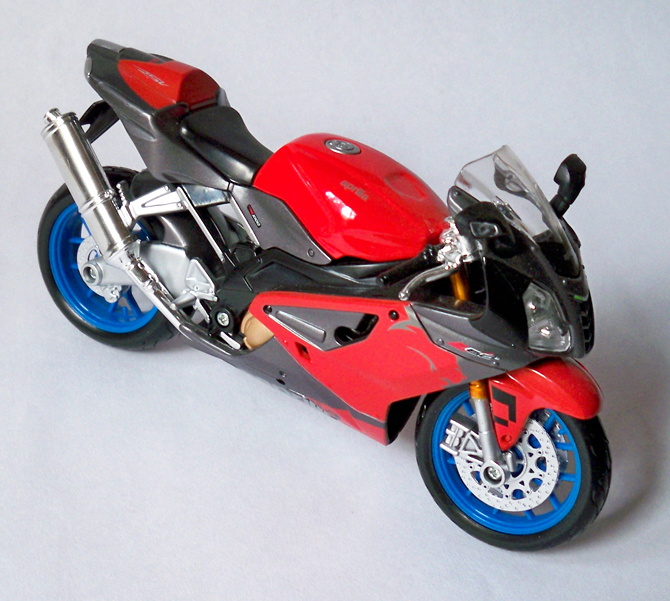 this was my first bike and the worst thing about it was that the chrome from its exhaust pipes started to strip off on its own..i noticed the same thing on the other 1:18 bikes too.and thus i prefer the ones who doesn’t large amount of chrome on them.though new ray aprilia rsv factory is simply marvelous. Chrome issues can be found in almost all the budget models like Maisto and likes, but I guess I am lucky with this Aprilia.